In July, 2012, Stryker recalled its Rejuvenate and ABGII hip replacement systems. The recall, which was late in coming, was because the Stryker hips have been demonstrated to be vulnerable to corrosion and fretting, joint dislocation, and, because they are metal-on-metal implant, they release of metal into the body that can cause a whole host of problems. This recall is for 30,000 of the Stryker hip systems. As you can expect when a company says, “Oops, this product is messed up”, lawsuits have followed in massive numbers. Stryker sold these implants hard. And people were buying. Like crazy. The ability to go in and surgically replace or reinforce deteriorating body parts almost seems like science fiction. Who wouldn’t want a chance at a second lease on life with a new hip that is hoped to work almost like a new one? If are struggling with a bad hip, you will turn to anything that solves the problem. I don’t know what the life expectancy of Neanderthals was, but I doubt many of them made it to the age where arthritis was an issue. And, if they fractured a leg while fleeing predators, they were probably done for. Today, we have the ability to give futures to people with osteoarthritis and traumatic arthritis. The companies have patients that are desperate for relief. Stryker has been putting out orthopaedic devices for some time. In 2003, they launched the Trident series of hip implants. These were supposed to be revolutionary, largely because they were made of ceramic components instead of metal or plastic, which was then in vogue. These ceramic devices were marketed as more durable—so much so that many patients were told that they would never need another hip replacement surgery. Stryker did a great job cornering the market with their product. The quality of these hips was a different matter all together. Customer complaints started rolling in from 2005 to 2007. It seemed that the hip implants had a tendency to squeak. They made noise when moving. That’s a problem. Now, most implants like this will, once in a great while, make a sound. However, the orthopaedic industry has never heard something like this. Prompted by customer complaints, the FDA examined Stryker’s Ireland and New Jersey manufacturing plants, and found significant sterility problems. They sent letters to Stryker, attempting to prompt them to fix the problems. (Note—the sterility issues do not appear to be related to the squeaking issues). After the onslaught of problems, Stryker issued a “voluntary” recall of many of its Trident hip implant devices. This time, the problem seems to be the design of the Stryker Rejuvenate. It is always something with these hips. It is another bad design. It was just a bad idea. I think everyone gets that now. The Stryker hip does not have a metal interface between the ball and the cup. Not a bad thing, since the metal on metal hips have been a disaster. But the Rejuvenate hip might be just as bad. It causes an injury just like the DePuy metal-on-metal-hips with a little different mechanism. 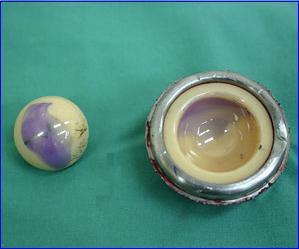 The metallic debris is caused by micro motion of the metal joints connecting the implant’s stem in the femur to the ball in the artificial hip. How bad it is? Some doctors think that as many as half of these hips could fail causing painful revision surgery. Do you need help sorting out whether you have a claim? We can help you. Call 800-553-8082 or get a free on-line consultation.